Marilyn Meberg is never funnier than when she is talking about the Bible. But she is more than just funny. 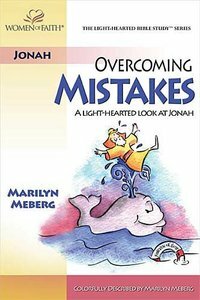 She is well-versed in Scripture, has taught it far and wide in front of more than two million women at the Women of Faith(R) conferences, and had devoted her life to the hilarious pursuit of spreading the gospel of Jesus Christ.^Overcoming Mistakes is a Light-hearted Bible study(TM) on the Book of Jonah. About "Overcoming Mistakes (Light-hearted Bible Study Series)"